Nvidia is turning the heat on in the battle of the x-cored ARM chips and has declared quad core ARM chips this August codenamed Project Kal-El (Superman’s name on Krypton). 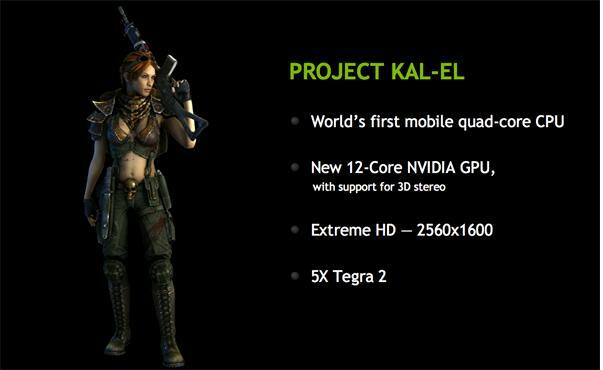 Nvidia showcased one of the Tegra “super chips” streaming video on a 10-inch 2560×1600 Android tablet at the Mobile World Congress in Barcelona a few days back. 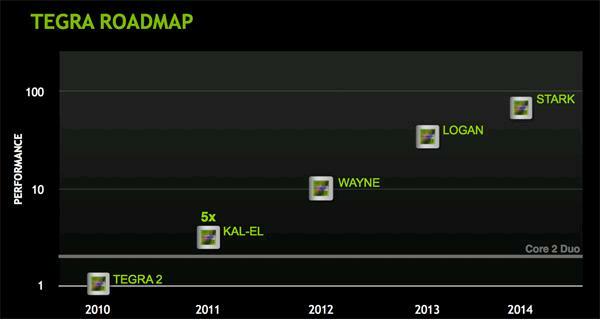 Nvidia published a roadmap anticipating yearly follow-ons called Wayne, Logan and Stark between now and 2014 that will progressively offer 10x-75x more performance than the company’s current Tegra 2 used in the Motorola Xoom and the Samsung Galaxy Tab. Interestingly, this came right after Qualcomm that its Andreno 320 quad-core Snapdragon widget won’t sample until early next year.The Qualcomm chipset is supposed to be the flagship of a new Snapdragon family based on a new 28nm microarchitecture code named Krait, which in real life is a very venomous snake. It should achieve speeds of up to 2.5GHz per core and minimize power consumption and heat generation in thinner, lighter devices with bigger screens, higher resolutions, integrated WiFi, more complex operating systems, devices capable of multitasking, multi-channel audio, HD gaming and stereoscopic 3D (S3D) photo and video capture and playback. It’s supposed to offer 15 times Qualcomm’s available performance and 75% lower power consumption than the first Snapdragons. The Interim analysis thus is a thumbs up for Nvidia over Qualcomm and in the overall context, ARM has a huge edge going forward against Intel. From the computing domain perspective, ARM is rapidly adding processing power on chips which are that much more energy and heat efficient. That’s great news from the smartphone and tablet perspectives. Apple notched up 82.7% of revenues from Apps stores globally in 2010. While this figure is marginally down from Apple’s 92.8% market share in 2009, it is testimony to the fact that in terms of mobile application stores, Apple remains far ahead of the competition, with the other stores so far unable to replicate Apple’s success in generating revenue from users. Apple, in contrast, has been able to maintain advantage by leveraging its tightly controlled ecosystem—combining compelling hardware and content with the capability to offer consumers a trusted, integrated and simple billing service via iTunes. Revenue for the Apple App Store rose 131.9 percent to $1.8 billion in 2010 from $768.7 billion in 2009.Global revenue for the total mobile application store market in 2010 increased by 160.2 percent to reach $2.2 billion, up from $828 million in 2009. Helping Apple’s cause in terms of profitability was iPad, which even with a smaller installed base made more margins per app, disproportionately impacting Apple’s Revenue. By 2014, about 50 percent of Apple App Store revenues in the United States will be generated by iPad users, up from less than 20 percent in 2010. Apple is expected retain more than half of market revenue at least through 2014. Research In Motion’s BlackBerry App World retained its No. 2 rank with 360.3 percent growth. The company’s share increased to 7.7 percent in 2010, up from 4.3 percent in 2009. Nokia’s OVI Store posted the second strongest growth in 2010, with revenue rising by 719.4 percent, giving it 4.9 percent share of the application market business, up from 1.5 percent in 2009. Google’s Android Market made the most dramatic advance, with revenue soaring 861.5 percent for 2010. This allowed Android Market to take 4.7 percent share of global mobile application store revenue in 2010, up from 1.3 percent in 2009. In the pre-read to this post, i had written about how Internet, the way we know it is fast coming to a saturation and how mobiles will fuel the next growth engine for Internet. Most of the terms and facts used were the clichéd variety. 1. Internet is mostly a Pull medium as against a Push medium. For instance, a user gets to know about a particular Facebook update only when he logs into Facebook. An App changes that. It pushes the Facebook Update on the device and is thus more immediate and relevant than delivery through the Internet. 2. Internet is static medium (low on mobility experiences). Even if a user uses a laptop, the device is incapable of “external intelligence” i.e Time, Location, Context, User Experience. Thus it would only be a communications device than a experience device for the user. An App with its various APIs is more intelligent to “external” than the internet delivered as a static medium. There are many software engines and APIs which could make the content delivery contemporary to the context of the user. A simple example here is an LBS service or a NFC led discovery. Thus the App adds the dimension of “experience” to the user context. 3. Apps with their ability to wrap around the user context, experience, intelligence thus becomes a far more effective medium for monetizing services. The App thus takes up the role of a media to deliver sponsored messages to the user. Imagine planning your holiday with Thomas Cook App, which not only includes tickets and stay, but also a mobile based tour guide app which takes you to “your” kind of places, basis the system intelligence of your preferences. Imagine a advertising eco-system that can be built out a local context through this medium. 4. Applications could be delivered through any and many screens: TV, Computer, Mobile and even in cars. One application could travel with the user across his usage dynamically to address him on TV when he is watching a game, on mobile or car when he is travelling , on computer when he is in office. 5. Last but not the least is Apps ability to drive Mobile health, Mobile banking, mobile education solutions across a diverse geography. There’s enough thats being done in the area of basic amenities and utilities to deliver life services to billions through mobile phones and apps. Thus, apps would alter the way internet is delivered to the next lot of internet users in the world. The medium would be highly customized, very mobile, very user context and experience specific. Best of all things, it could provide unique monetization opportunities to a very diverse eco-system. In an earlier post, i had written about focus on innovation for apps and services to customer centric models amidst larger value creation templates with more stakeholders. It also shows the roadmap and indicators for value creation. So here’s the cliche no.1: Europe 58.4%, North America 77.4% and Australia 61.3% is where Internet growth is falling. Having featured the first wave of internet growth, it was about time, that the fast and furious growth in Internet numbers abated here-on. Also, these geographies house only 17.4% of the world population. Hence, the next level of growth in Internet has to be powered by 82% of the world pop scattered around elsewhere. Cliche no.2: BBC estimated sometime around mid 2010, that the number of mobile phones globally has hit the 5 billion mark. Infact, there were interesting comparisons about Mobile phones and bank accounts and toilets, each a surrogate milestone in development of the world. Cliche no 3: It is therefore expected that Mobile phones will be the next carriers of internet to a very large population around the world. That, more then half of the 5 billion phones are typically low end phones with very little capabilities will severely test the delivery mediums of Internet. 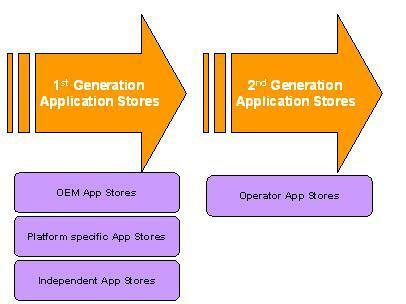 In the earlier post, i had written about the evolution of application stores. 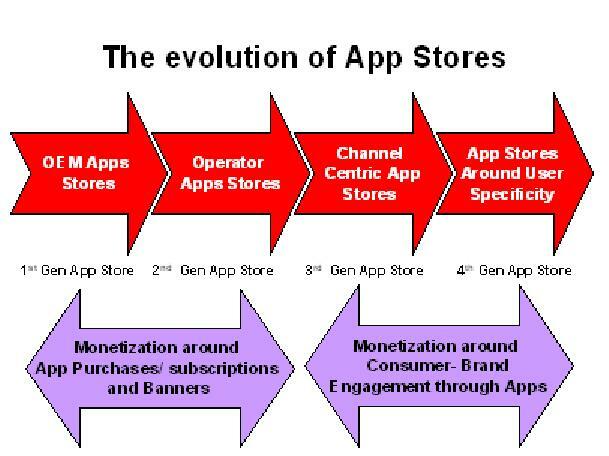 1st Gen and 2nd Gen Apps stores were great in as far as apps in principle were concerned.But the real test of Apps stores is in the MONETIZATION bit. Millions of Apps and Billions of Downloads are great stats to convince USER ENGAGEMENT, but “it aint mean nothing” if it makes no money and Monetization is the key. To provide an analogy, a radio station with great broadcast content and listener-ship is great from a user engagement perspective, but the station does-not make money unless there are sponsors. And then the monies can be used for better content, more broadcast rights, bettering the quality of the programmes etc. Sponsors use the radio station as another media channel to reach out to the listeners to create awareness and engage their consumers better. Majority of the listeners will not possibly not want to pay for the programmes directly, but don’t mind being part of the channel. The same applies for Apps as well. The key addition here is “sponsors”. Sponsors would use the apps as another media channel to reach to consumers and engage them more effectively. “More Effectively” reflects the ability of applications to profile its users better and thus a greater match between target audience and the sponsor message. On a very initial level, this could be ads and we all know how iAds, inmobi or Admob are able to advertise better to the consumer through ads in apps. Thats just the beginning. Globally app stores are monetizing traffic through in-app and in-store subscriptions/payments.However, there is a larger picture that many of us are missing in terms of media capabilities of apps stores & how brands could use apps as a channel to engage consumers. Apps with their unique push capabilities and API sensitiveness can be a very efficient medium for reaching and engaging out to Brand users/consumers. Under the constraints of consumer freetard-onomics, the answer to monetization problem lies in getting a key stakeholder who has yet not been a part of the eco-system: Brands. To me, Brands today and tomorrow will try establishing apps as a key channel to establish an engagement with consumers. This according to me will establish what i call the third evolution of Apps stores which would centre around Channel and User Centricity. Thus apps will increasingly go from just an app to enable branded life-style experiences around focussed groups of users. 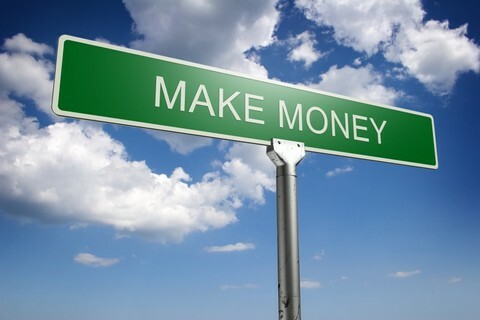 That to me is where Applications and Platforms will monetize. We would need APIs enabling the portfolio of services such as LBS. LAYAR, Search and Profiling engines, Shopping Carts, NFC and Analytics is more than adept at taking this Brands concept to fruition. To me this rivulet is the mother lode of monetization going forward. Android and Apps were two buzz words of the 2010. While Android went places and became the No 1 platform for smart-phones globally, Apps went on to become the “word of the year 2010” as chosen by American Dialect Society. Apps in the mobile computing parlance adorned ubiquity as symbolized by the clichéd “There’s an App for that” maxim. One has to walk a step back and look at the evolution of App stores as it stands today and then try and extrapolate apps into future. 1. The first App stores were all OEM Apps Stores. The intent was experience differentiation for the user. So we had the iPhone and Apple Apps Store, Nokia and the Ovi Apps Store, Blackberries and the Blackberry App world and a few others. 2. Along the same time, there was a parallel development of Apps stores around Operating Systems/platforms. There were Android and Windows which were Platform specific running across range of Device manufacturers. 3. The next level of Apps stores were really the “independent” app stores as against the “local stores” which were hard-bundled on the device. These were device agnostic in the sense that they catered to all device platforms. 4. A significant portion of the apps store activity was actually happening at the device sides leaving the carriers out in the cold, relegating them to the “Proverbial dumb pipes”. Many large, medium and small Telecom operators/carriers have started launching the Operator Apps stores. By partnering with VAS companies, third party “white labelled” app store makers and other software developers, Operators launched apps stores for users. In spirit these were consistent with the independent apps stores offering applications and VAS across a range of devices they were servicing. Tablets sold a total of 19.7 million units in 2010.iSuppli expects this number to be 242.3 million units in 2015.Thats a factor multiple of 12 and a CAGR of 65%. iSuppli expects that this remarkable expansion of the tablet market from 2010 to 2015 will be driven by three successive waves of growth.The first wave, which is hitting in 2010 and 2011, was created by the arrival of the iPad and the ensuing tsunami of demand for the device. The second wave, arriving in 2011 and 2012, will be propelled by a deluge of iPad competitors, particularly Android-based models. The third wave, which will turn up in 2013, will consist of a flood of models based on the Windows operating system that will expand the reach of tablets into traditional computer markets.While the iPad will lead annual tablet shipments through 2012, the increasing strength of media-tablet rivals combined with the advent of PC-type platforms will cause Apple to lose its majority of total unit shipments starting in 2013. Prior to the introduction of the iPad in 2010, the tablet market represented a sleepy niche of the mobile PC market, with small volumes, negligible growth, and sales limited to small group of users in professional markets. 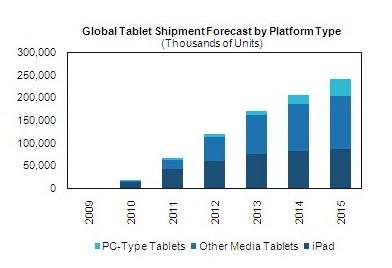 Shipments of these PC-type tablets amounted to less than 2 million units in 2009. The arrival of the iPad changed all that, helping tablet sales surge by a factor of 10 in 2010.The iPad’s huge head start both in unit share and ecosystem development will allow it to maintain its market dominance in 2011 and throughout most of 2012 despite the influx of competitors. New model introductions in 2011 and 2012 will continue to boost iPad volumes and allow Apple to maintain a premium for its newest models. However, Apple will face increasing price competition from competing media tablets, many of them incorporating the Android operating system. Some of those tablets will enter the market with features more comparable—or in some cases, superior—to the current version of the iPad. Furthermore, Google is spearheading an effort to speed development of tablet-oriented content for Android-based devices. The year 2013 will mark a critical juncture, as the tablet market turns into a battleground between media tablets using mobile operating systems, and PC-type tablets employing the Windows operating system.Microsoft likely will introduce a tablet-oriented version of its Windows operating system in late 2012 or in 2013 that not only will be better suited to touch-screen applications, but also will allow for content-creation tasks. The expected expansion of the current consumption-oriented media tablets to incorporate more creation applications is placing growing pressure on traditional low-end mobile PCs, and the existing Windows solutions are struggling to gain traction in the tablet market. Microsoft and the PC makers will engage in a vicious battle to fight off the ongoing share grab from media tablets, even as many of these vendors offer media tablet solutions of their own. One could expect to see a blend of slates, convertibles and dual- and potentially tri-screen solutions as alternatives to the media tablet onslaught. The wide variety of solutions—and intense battle among operating systems and types of platforms—will continue to fuel the expansion of the tablet market in 2014 and 2015. Openwave (provider of context-aware mediation and messaging solutions) has announced Amplicity, a new browser-based concept, which would deliver apps seamlessly across different OSs and devices in an operator network. This is designed to enable developers to leverage valuable mobile operator network assets to more rapidly create and deliver applications within the browser. The intent is to enable developers to address hardware and software fragmentation through the use of web technologies, including HTML5. In order to improve the distribution process. Developers have always been making an effort to reach out to as many end users and devices as possible. The ability to build one application and have it reach as many users as possible without having to write different versions for different platforms and devices would benefit developers. Operators have always been an essential part of the internet ecosystem, and the data they possess is the key to beating over-the-top players in the battle for consumer mindshare. Openwave Amplicity allows operators to open up their networks to developers and third-party content providers to ultimately create smarter applications that rely on contextual information. Using Openwave Amplicity, developers will be able to market their applications to consumers and enterprise customers across a number of platforms, which will enable them to monetize these applications through contextual advertising. The Operating System (OS) application development scenario is currently heavily segmented, which poses huge challenges to mobile application developers. Various versions of the same OS keep arriving into the market with continuous development of the platforms, while the developers also find it difficult to design applications compatible with all the mobile devices due to a vast difference in form factors and capabilities of hardware available today. Openwave Amplicity offers a cross-platform footprint based upon HTML-5 to address this issue and provides developers with enhanced OS, hardware and software compatibility. It also offers a more customized browsing experience to the consumers, who will be able to receive contextually relevant advertising and marketing offers on their mobile phones. “.. we must build, catalyze, and/or join a competitive ecosystem”. Stephen Elop has sent the rumour mills ablaze with the statement of “joining” a competitive ecosystem. Elop’s first quarter at the helm of Nokia operations has seen a mix of good and bad news for the no.1 mobile devices company in the world. Net Sales have grown but profits have nose dived and while ASPs have been north directed, Nokia’s fall in smartphone market shares have been staggering. Elop is having a rough time steadying the ship and is now expected to announce major changes in strategy on 11th February. Many see it to be Nokia’s move into Android or Windows Phone. Will developers go for MeeGo? Honestly, it is hard to be optimistic. Thus, there is just one alternative, unimaginable until a year ago: that Nokia will start building phones with a third party OS, like any other device manufacturer excluding Apple. Options? Probably just two: Android or Windows Phone 7. While Elop could leverage his old roots at Microsoft to forge a new Nokia-WinMo combo, there is one problem – Windows Phone 7 is still not a winner (yet) and it needs to attract developers (a lot). Going with Microsoft is a bigger risk, but Nokia will be treated as “special” for sure by Microsoft. In any case, it must be an attractive proposition, because Microsoft will offer the moon.Windows Phone 7 needs developers and, possibly, having Nokia behind it will attract them. If that happens, we’ll have a third OS with equal chances to Android and iOS. However, Nokia could take the Android root. Google is not the easier partner to work with and Nokia will probably not be considered “special” by them. But it is a sure bet. Nokia with Android will sell a lot. It is a killer combination. So, from what it looks Elop would have to choose between being Android’s many wives, loosing differentiation but boosting sales or partnering with WinMo, which will take time in terms of the developers base building up, sales kicking in. What is it… the Hobson’s choice?